www. Apartment Schwäbisch-Gmünd. de: We rent a duplex penthouse apartment. It is 104 square meters, is located in. 3 Floor of an apartment building and has an open dining area for six people, three sheep room and two bathrooms. From the loggia you can look to the south of the Rechenberg. The kitchen is equipped with dishwasher, refrigerator and oven. In the cupboards you will find dishes, pots and utensils in large scale. Between kitchen and living room is the dining area, the transitions are open. A TV and a stereo system can be found in the living room. There is an internet connection. A double bedroom is located on the ground floor, two further bedrooms can be reached via a wooden staircase. A baby or Cot can be placed in all three rooms. The smaller bathroom with shower and toilet is located in the lower part, the upper bathroom has a bathtub, a washing machine and an additional toilet and a bidet. Ins large bathroom is accessed by one of the two upstairs bedrooms. Your car can be parked in the parking space in front of the house. If required, we provide a cot / crib, highchair, potty, toilet seat, baby monitor, kick and toys available. Towels and linens are provided. Likewise, vacuum cleaner, hair dryer and drying rack. Food they can 'actively market Mangold Edeka' buy in, this is approximately 1 km to the Unicorn Road. Several bakeries, Kreissparkasse, a beverage market, a pharmacy and a butcher's shop are all within walking distance and are also at the Unicorn Road. The butcher Scherrenbacher (Donzdorf Straße 16) is recommended, there also small dishes are offered at noon. With the bus number 4 to get to Schwabisch Gmund. The next stop is at the Unicorn / corner Wall Street. The bathroom downstairs has a shower and a toilet. The bathroom above belongs to the large bedroom on the upper floor. Here are the bath, the washing machine, a toilet and a bidet. The property was as described, clean and spacious. Has everything you will need inna home, all you need to take with you is your clothes. There's toys for families with younger children and games for the whole family. The Gungor's were very friendly couple and made our stay in Schwaebisch Gmund worthwhile. 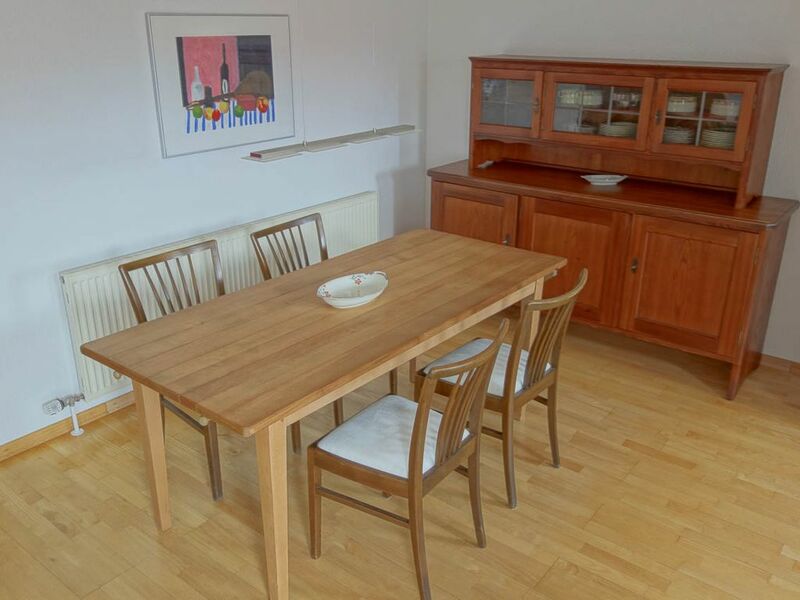 Located in a quiet residential neighbourhood with close by amenities like supermarkets, banks, pharmacy..
wir hatten selten eine Ferienwohnung, die so top ausgestattet war. Hier fehlt es an nichts. Die Wohnung befindet sich im ruhigen Ortsteil Strassdorf. Vor Ort sind zwei Bäckereien (auch Sonntags geöffnet) fußläufig zu erreichen. Ebenfalls in kurzer Distanz ein Edeka und die Sparkasse. Mit der Buslinie 4 kommt man bequem in die Innenstadt von Schwäbisch Gmünd. Eine schöne große Wohnung, wo man sich wie zuhause fühlt. Super ist die Dachterrasse mit dem Blick auf die Kirche und den waldbewachsenen Rechenberg. Sogar sonntags kann man in der Nähe (ca. 5 min Fußweg) frische Brötchen kaufen. Küche: alles Nötige da, außer Tiefkühlfach. Den Geschirrspühler sollte man nicht bei Nacht laufen lassen, da das Gerät beim Wasserholen laut pfeift. Die Wohnung ist sehr sauber und angenehm. Die Besitzer sehr freundlich und hilfsbereit. Gerne wieder! Vielen Dank für den tollen Service und den freundlichen Empfang in der Ferienwohnung. Wir haben uns sehr wohl gefühlt und uns über die sehr gute Austattung besonders der Küche gefreut. Unsere Teenager waren glücklich das WLAN nutzen zu dürfen. Die Wohnung ist gut mit Bus ans Zentrum von Schwäbisch Gmünd angebunden. Wir konnten aber auch direkt loswandern zum Rechberg oder zum römischen Bad. Wir kommen gerne wieder.